Winner of the 2003 Phoenix Desert Rose Golden Quill contest for Best Paranormal. 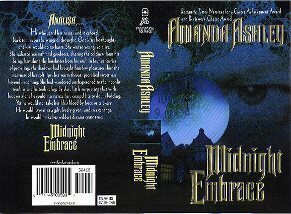 Reader Stephanie Ann said: "I just finished reading "Midnight Embrace" by Amanda Ashley. It was quite amazing. I want to cry that I read it so quickly. If you love paranormal romances this is a must have to add to your library. Extremely well written! It is a definite 10 out of 10." Analisa is close to death. When a high born gentleman whisks her from the hospital bed to his luxurious home, she is unsure as to what is expected of her. Why does she hardly ever see him? Is he just eccentric, or is there something more sinister going on? When Lord Alesandro de Avallone finds Analisa in a hospital, he cannot bear to leave her there. But how can he keep his secret from her? What is he willing to do to ensure her safety and his existence? When you find the one you love, can you leave them to their own fate or will you do all in your limited power to ensure a better life? Can you keep the dark aspects of your life from the ones you care about? Let me start off by saying that there are some similarities between A Darker Dream and Midnight Embrace. That being said, Midnight Embrace is also a story that stands on its own. The story of love, chance encounters, and good versus evil is one we all enjoy. I enjoyed the feelings that Midnight Embrace invoked. I liked Alesandro’s attempts to protect Analisa, but I also enjoyed Analisa’s practicality. It was a refreshing change from the time period’s wimpily written females. If you enjoyed A Darker Dream, then you will like Midnight Embrace! "Friend against Friend, Good against Evil - Vampire indulges Thirst for Revenge"
For four hundred years Alesandro cursed his existence, unsuccessfully sought ways to change his fate, and once he’d learned to control his altered nature, he had committed himself to quenching his raging hunger in a way that was true to his former human calling. On this particular night he’d sensed one mortal among the many around him who had what he needed, and needed what he could give – life for life. She was young, she was dying, she was alone. Analisa Matthews had come from a poor family, but it had been such loving one that hard work had never been a burden. She had been happy. Now the epidemic which had claimed them would soon claim her as well. She felt the end coming. It was plain that her doctor held little hope. Weak, and with no one to live for, she is resigned to her fate. That night she is visited by a strange doctor who claims he’s been called by her doctor to can help her. Later she remembers his visit, but the rest is foggy. She feels wonderful though, and her doctor is amazed that she’s rallied. Analisa is concerned however, when Dr. Martinson claims no knowledge of the other doctor, suggesting that she’d been dreaming. It was no dream. The mystery man returns the following evening. She is afraid, even more so when she realizes that her doctor cannot see him. Her blood was sweet and pure. He’d never tasted anything like it, never known anyone like her. She would make a full recovery, but have no place to go. He could provide for her needs, and she for his, for only a little while, he swears to himself. He would then let her go and make sure she never wanted for anything. Overnight Analisa had become Cinderella. She had never met her benefactor, Lord Alesandro de Avallone, though she’d heard rumors about him. He’d settled her accounts at the hospital, and had offered his home to her while he was away. For a while at least she would have servants, lovely clothes, a roof over her head. She is not accustomed to such luxury, but spends her time well, learning to read and write. She wonders what she will do when Avallone returns, and she must find someplace else to live. Her dreams are troubled, he calls to her with a yearning that cannot be denied. She is temptation incarnate. The beauty of her soul as well as her blood call tempt him. He cannot stay away. He’d been a mortal doctor once and he had done what he’d done for Analisa many times over in his new life. None had made him care beyond the mutual need for healing. He had never before encountered a woman so innocent and giving. He finds in her what he had never found in life or in his four hundred years as a vampire. Love. He loves her. She claims to loves him as well, accepts what he has become. But she isn’t safe with him. His own lust for her body, and her blood, makes him dangerous to her. He has an enemy though that is even more so. Rodrigo had been his friend in life. They had acquired the Dark Gift together. Rodrigo relished the change. He had loved Alesandro’s sister Serafina and had wanted to make her what he was, so that they could be together forever. Alesandro had been appalled. He wouldn’t wish this life on anyone, especially not his beloved sister. His warning had fallen on deaf ears, Alesandro had had to show her. It had been too much for her mind. She’d gone mad and taken her own life. Rodrigo had held him to blame for his loss and had promised revenge. Rodrigo killed for the joy of it, for the power it gave him. He’d been toying with Alesandro for years, invading his territory and leaving behind victims near death. It was always a race to see whether or not the good doctor could save them in time. Now he’d struck close to home. The warning is clear, his goal is Analisa. At last he would have his revenge, make Alesandro suffer the loss of his love, as he had suffered the loss of Serafina – for eternity. It comes down to good vs. evil. At times Alesandro is frustrating, he has so many opportunities to put an end to Rodrigo, but I suppose that it says something about his character, about the humanity that hasn’t quite abandoned him, that he is loathe to sever his ties to his past, to destroy the man who had once been his friend. He is frequently assaulted by doubts that he can make a life with Analisa, causing them both unnecessary pain. Analisa is the jewel in this tale. She is selfless, loving, and brave. She faces true horror and defeats it with love every time. In her own way she is stronger than either of the vampires playing tug of war with her, a worthy heroine. He prowled the moonlit streets and shadowed byways, driven by a relentless hunger and an overpowering need to help, to heal. It was who he was, what he had been born for, until Tzianne swept into his life and literally turned his days to night. He thrust her memory away. He emptied his mind of all thought, and listened to the heartbeat of the city, homing in on the one soul who had what he needed. Who needed what he had. Gathering his cloak around him, he became one with the dark shadows of the night. She was dying. She had always feared death, certain it would be accompanied by terrible unending pain and horror. But now, lying on a narrow bed in a darkened hospital room, with long fingers of silver moonlight making ever-changing patterns on the wall, she felt nothing but an over-powering weariness and a vague sense of curiosity about what came next. Was there truly life after death, a place of peace and rest without pain, as the priest had promised her, or was there nothing beyond this life save an endless black void? She felt herself slipping away, teetering on the brink of sleep, or perhaps the eternal abyss of death, when she felt it, a sudden coolness in the room, more a feeling than an actual physical chill, and with it the certain knowledge that she was no longer alone. Fear came quickly, manifesting itself in the nervous shivers that wracked her body, in the sudden dampness of her palms. He appeared out of the shadows, black against black, almost as if he were a part of the darkness itself. “How are you feeling?” His voice was low, filled with a dark sensuality that sent a shiver of awareness down her spine. She stared up at the hooded stranger, her heart pounding as he moved closer to her bedside. He was tall and broad-shouldered beneath the fine black wool cloak that fell from his shoulders in graceful folds to the floor. She couldn’t make out his features, only that his hair was long and dark, blending into the shadows around him. “Are you a doctor?” she asked tremulously. She shook her head, mesmerized by his eyes. They were blue, a deep, dark blue that seemed to be kindled from a light within. Strange, she could see the color of his eyes when she could see little else. He leaned toward her. She tried to look away, but it was impossible to take her gaze from his. She felt as though she were being drawn into the very depths of his eyes, until all she could see, all she was aware of, were his eyes. Blue, so very blue, like a fathomless indigo sea beneath a moonless night. She felt his hand at her neck as he brushed her hair aside and then leaned over her. She felt a brief, sharp pain, as though something had bitten her. Moments later, his gaze captured hers once again. Helpless to refuse, she did as he asked and was immediately filled with a sense of euphoria . Gone was the weakness that had plagued her, the weariness that had weighed her down, the coldness so deep inside her. Warmth flowed through her veins, strengthening her, making her feel as though she could leap from the bed, as if she could run. As if she could fly. She didn’t want to sleep, not now when she seemed filled with new life, but his voice wrapped around her, low and soothing and seductive. And completely irresistible. She stared up at him, trying to see his face, trying to fight the sudden lethargy stealing over her limbs. She wanted to ask who he was, what he was, but a blackness as deep as eternity swept her away before she could form the words. She woke to the singing of birds and the rattle of the milk wagon on the cobblestones below, woke feeling better than she had in weeks. Almost, she felt as if she could jump out of bed, walk, run. But it was only an illusion, she thought. She had heard too many tales of people lying at death’s door who experienced a last, sudden burst of false energy. “What is it?” she asked, fearing that death was closer than she feared. She stared after him. Had it been a dream? But it had seemed so real. Overcome by a sense of disappointment, though she couldn’t say why, she drew the covers up over her head and drifted off to sleep to dream of a tall dark man in a hooded cloak the color of midnight. A dark shape detached itself from the deep shadows of the room. Last night, she had fancied that he was a part of the darkness. On this night, she knew he was the darkness. “I gave you nothing.” She took a deep breath, opened her mouth to scream for help, but he was suddenly at her side, his hand on her mouth stifling her cry. She stared up at him. How did he know her name? Who was he, this dark stranger with the compelling voice and mesmerizing eyes? She shook her head, her heart pounding loudly, erratically. He hadn’t hurt her, but there was something about him that frightened her. Something dark and intangible. “Good evening, Analisa, how are you feeling?" She stared at her doctor, waiting for him to question the stranger's presence in the room, but Doctor Martinson walked by the stranger as if there was no one there, though she could see him plainly. He was standing in the shadows, as still and silent as death. "Who's that man?" Lifting her hand, she pointed a trembling finger toward the stranger. The doctor glanced around the room, his brow furrowed. "What man?" Doctor Martinson smiled indulgently. "You must have been dreaming again, my dear. There's no one else here." She stared at the stranger while the doctor examined her, wondering if she was going insane. She saw the cloaked figure so clearly, but if the doctor could not see him, then surely there was no one there. Perhaps she was having delusions of some kind. She had been ill for so long, perhaps in her weakened state she could no longer discern fact from fantasy. But she didn’t feel weak and sick today. She felt stronger this evening than she had in weeks. Perhaps the hooded man was Death come for her. Perhaps that was why only she could see him. Her grandmother had told her that Death rode a dark horse. She giggled softly. Of course, he couldn’t ride his horse into her room. She nodded, her gaze still on the hooded man. “If you condition continues to improve through the night, I think you will be ready to go home tomorrow afternoon." He patted her hand. "Rest well, my dear." She watched him leave the room, the stranger momentarily forgotten. Home. She had no home, no place to go when she left here. The sound of her name on his lips sent a shiver down her spine. "What do you want? Why couldn't Doctor Martinson see you?" He moved toward her, bringing the darkness with him. "Because I did not wish to be seen. As for what I want with you, only what I desired last night." She was trembling now. "What did you do to me last night?” She lifted her hand to her throat. “Did you give me an injection of some kind?" Her blood. It was sweet, so very, very sweet, and he drank and drank, despising himself, despising his inability to control the need that burned through him, yet reveling in the warmth that flowed through his limbs, chasing away the cold that was ever a part of him, giving him an illusion of life, of mortality. He drew back to gaze at her face, imprinting her image in his mind. She was a beautiful child, her oval face framed by a wealth of ebony curls. Beneath closed lids, her eyes were the color of sun-warmed earth, large, luminous eyes, innocent and without guile. Her brows were delicately arched. Her nose was perfectly formed, her lips as pink as the petals of a wild rose, her skin smooth and unblemished. And warm. So warm, so alive. How many times in the last four hundred years had he stolen the elixir of life from a child as pure and innocent as the one lying helpless and vulnerable in his arms? It mattered not that he drew them back from the brink of death and gave them life in return. Who was he to interfere with Fate? What right did he have to play with the lives of those whose blood he took? This would be the last time. When he left here, he would wander the streets in the company of innocent mortals one last time. He would drink until he was replete, and then he would seek oblivion.